The craziest thing happened last week…. 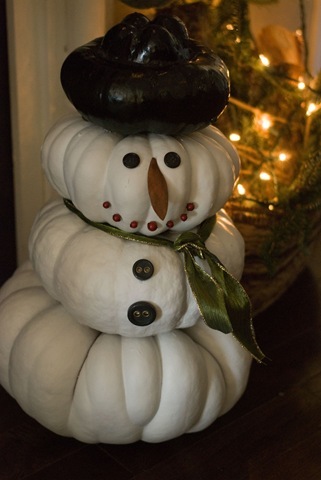 Five years ago, I turned my leftover pumpkins into a snowman. Do any of you remember Frosty the Pumpkinman? He sure was cute! I just never dreamed that one day he would have me making an appearance on Good Morning America!! Well, hold on… let me back up. Last Sunday night around 9:30, Tim and I were just casually sitting on the couch watching t.v. when my email dinged. I don't normally check my email immediately, but I was waiting to hear back from a company about an order I had made, so hoping it was from them, I checked my email. But the email was actually from a producer at Good Morning America asking me if I would be interested in coming on their show on Friday (5 days later) for a segment called, Holiday Hacks, and showing America how to turn their leftover pumpkins into a snowman. I was completely taken off guard. Shocked. Mind-blown. Speechless. Terrified. All the feelings. I shoved my phone in Tim's face and asked him what he thought. He googled the producer's name to make sure it wasn't a hoax. It wasn't. So he said, "You should do it." Just like that. So casual. Meanwhile, I couldn't wrap my brain around standing in front of millions of people and showing them how to make a pumpkin snowman. If you know me at all, you probably know that public speaking of any kind is not my thing. As in, I'm terrified of it. I changed my major from elementary education in college because I didn't want to stand in front of my classmates and do practice class lessons. I would much prefer to be on this side of the screen writing blogs or taking pictures. That night, I forwarded the email to two close friends and then Tim and I called his parents and mine. Of course, we all agreed that it was an unbelievable, once in a lifetime opportunity. And I knew in my gut that I couldn't just pass it up because I was scared or I would always regret it. It felt like God was opening a door for me and He wanted me to walk through it. He seems to be having fun lately showing me that He can do absolutely anything in my life that He wants to. The email said if I was interested, to please make a video that explains and shows how to make the pumpkin snowman, upload it to youtube, and then send them the link by early afternoon the next day. These videos are how the bosses approve which guests get to be on the show. Talk about a time crunch and tad bit of pressure!! I'm not a video person. I'm a blogger. So all of a sudden, I went from looking forward to an easy week in which to finish up all my last minute Christmas stuff before my kids got out of school for Christmas Break to being completely stressed out, overwhelmed, can't sleep, can't hardly eat, scared out of my mind. But I also knew I just needed to take things one step at a time. And the first step was the video. So on Monday, I made the video, just doing the best I could on such short notice. I emailed it to GMA around 1:00 pm like they requested. And I prayed they would pick someone else. The producer called later that afternoon and said she still needed an official okay from the bosses, but she wanted to go ahead and get all my information to start making the travel reservations. I begged God to slam this crazy door closed. I waited and waited. On Tuesday evening I got the official green light email that I had been dreading. I immediately called Tim and told him that we were going to NYC! 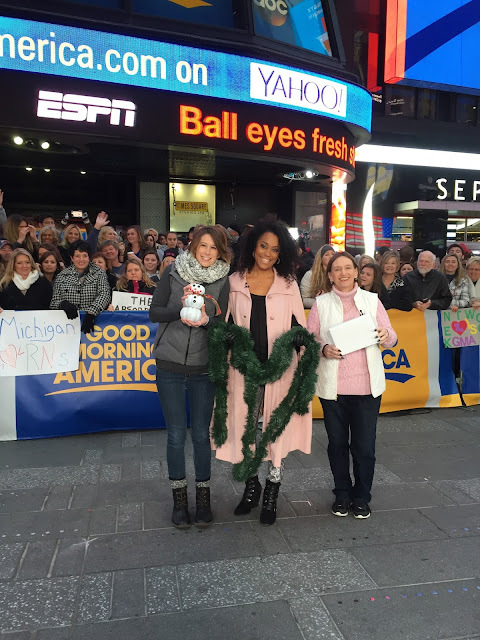 I couldn't believe that I was going to be on Good Morning America talking to millions of people on live television in just a few more days. This was not my dream come true, this was a nightmare I was going to have to face. People kept asking me if I was excited and I kept saying, "No! I'm terrified!" Like in every sense of the word. I am not exaggerating for drama here. I was seriously terrified. There were times when God gave me a calmness that I couldn't explain and didn't make sense. But there were other times when the fear was so overwhelming that I felt like I just wanted to throw up. I spent a lot of time praying and listening to God, asking for His peace, needing to hear His voice and be reminded that He would get me through. This was not something I could do on my own. I needed him to show up for me big time. I just kept asking, why me Lord?.. of all the people that would love to get up in front of millions, why are you choosing me? This is not my thing!! I'm not ready for this! I can't do this. Please, please choose someone else!! As I sat with the Lord and listened, some of the impressions I felt on my heart was that this was all His plan and even though I never imagined (or wanted) anything like this, He wanted me to surrender, to flow with Him, trusting that He was the current in my life, taking me where He wanted me to go. This was something He was doing and He wanted me to let go of trying to control my life and relax, allow Him to work, and trust that wherever He takes me, He will get me through. He said that His timing was perfect and that He had prepared me. He reminded me that I was His and that He would be faithful to me. All of that was very encouraging, but the fear was still so loud and overwhelming, making me feel sick to my stomach and anxious almost constantly over the coming days. An interesting side note : A few weeks back, Tyson has asked me when we could to to New York. At the time, we had no real plans to go, so I just told him that we would go one day, but I didn't know when. Now here we had such a unique opportunity to take the kids to see NYC at Christmastime. I told Tyson that God had heard his heart's desire to go to NY and He was making it happen. I want my kids to recognize when the hand of God moves in their lives and He does something extra special for them just to show them He loves them. On Thursday afternoon, we loaded up the kids, dropped the pets off with neighbors and drove up to NYC. I cannot even tell you guys how nervous I was. I didn't sleep a wink that night. I had to be at the studio at 5:15 in the morning, so I got out of bed at 4:15 to get ready. There were times when I honestly didn't know if I would be able to go through with it. This was the hardest/scariest thing I have ever had to do. Thankfully, the staff at GMA were all so nice and put me more at ease. They reminded me that it was just a fun segment and I didn't need to worry about stumbling over words or forgetting what to say. They said to just try to forget about the cameras and have fun. And they reminded me not to overthink it. Obviously that's easier said than done, but it took some of the pressure off. We still practiced several times so we knew what we wanted to say, but the atmosphere was very laid back. I went to hair and makeup while someone went and got me a Starbucks and I felt a little bit like a movie star in that moment. So surreal. Then we did a few teasers where we were told to stand in front of the camera and dance with our props for all of America to see. I was thankful that I had a snowman to dance in front of the camera. One lady had garland and the other had a box, so I feel like that would have been a lot more awkward if on of those were my props. The teasers ended up being fun and actually helped me relax a little bit as I realized it wasn't so awful to be in front of a camera. Here we are getting ready to do a teaser. Tim brought the kids down to the studio just after 8 a.m. My segment was scheduled to be on at about 8:45. So we hung out in the green room for a few minutes then headed outside to wait for our turn. It was freezing outside and I couldn't stop shivering, partly from the cold, but I'm sure partly from nerves too. And then it was time! I said a desperate prayer of, "Jesus, Help Me!!" right before we started. And he did. Because I stood up there and said just what I needed to say and the words came out smoothly. It went fast. The two anchors did such a great job of keeping things moving and helping me get through it. And I was so so relieved when it was over. This picture below is just a screen shot. Scroll down for a link to the video. Afterwards, we showed the kids around NYC. It was such a special blessing to be able to do this. We had already decided to stay Friday night in the hotel so we wouldn't have to rush back home. We wanted to take full advantage of this opportunity the Lord had given us. We thought this gingerbread house at Anthropologie was awesome! We took the kids to Central Park. They had a lot of fun running around and climbing on the big rocks. About eight years ago, when I was pregnant with Peyton, Tim had a work trip to NYC and I got to join him for a few days. We took a picture (which I can't find or I would post it) sitting on a rock in Central Park, so here we are again eight years later. We think it's the same rock, but we're not really sure! We ate a really early dinner that night and were back in our hotel room by about 5:30. I was so exhausted that I was in bed just after 6. Tim and the kids watched t.v. until about 8:00 and then everyone went right to sleep. It felt so good to sleep without feeling a pit of nerves in my stomach every time I rolled over. On Saturday morning, we walked to Rockefeller Center because we thought we might take the kids ice skating, but the rink was so crowded (and it was so expensive) that we decided it wasn't worth it. We took some pictures in front of the tree and did a little shopping. Back at Anthropologie because they have the best window displays (and they were having a great sale!). I'm always amazed at what they can do with things like, oh, I don't know… cardboard! We had to take several different pictures because now each kid wants to take a picture. Of course the kids had to check out that Lego store too! After that it was time to head back to the hotel and finish packing so we could check out on time. I'm glad I did it, but mostly, I'm just really relieved it's over and that the Lord got me through it without me making a complete fool of myself on national tv. I'm also thankful for the time we got to be in NYC with our family at Christmastime. We made some special family memories. And I hope my kids remember that time their mom did something that was hard and scary but the Lord upheld her. I can't even say how much it meant to me to have people supporting me and praying for me through all of this. I'm not sure if I would have done it without the support of Tim and our families and friends. I was really reminded of how blessed I am to have so many people who love and care for me and cheer me on. You did great! I'm proud of you! Thank you so much LeAnn! That means a lot!